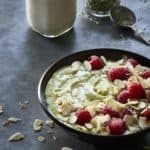 This matcha smoothie bowl is vegan and paleo-friendly, and loaded with healthy fats, chlorophyll, healthy fats, protein, and has a sweet delicious flavor. This matcha smoothie bowl from Windy City Organics is loaded with healthy fats, chlorophyll, protein, and essential fatty acids, and has a sweet delicious flavor. You can also tweak the sweetness and lemon edge to your preference, and then add whatever toppings you have on hand. Flavonol-rich matcha green tea joins forces with adaptogenic maca root, protein- and omega-rich chia, and Sunbiotics vanilla probiotic powder for a truly energizing and nourishing breakfast treat that is as easy on the tummy as it is on the eyes. Those of you who have The Blender Girl or The Blender Girl Smoothies app will have read my section on probiotics, and would be familiar with the fact that I add 1/2 teaspoon of probiotic powder to every smoothie I make. It’s an optional ingredient in all of the smoothies in the first book, and an option in the app. Adding probiotics to smoothies helps your digestion, balances the acidic effects of fruit, and replenishes your stores of beneficial bacteria. But, probiotics are certainly not created equal, and I’m really picky about which brands I use. One of the brands I love is Sunbiotics. If you don’t have probiotic powder, you could break open 1 to 2 probiotic capsules and empty the contents in your smoothie. Putting a smoothie in a bowl is a creative way to fortify a drink and make it more of a sustaining meal. You can get really creative and add some awesome toppings for a crunchy texture. Sweet smoothie bowls feel like dessert, and savory smoothie bowls are stacked soups. I really love this matcha smoothie bowl. Don’t miss it. It is really yummy. If you’ve got a favorite smoothie bowl recipe or some amazing topping suggestions, please share it in the comments below. *This is not sponsored content. I just love this product. 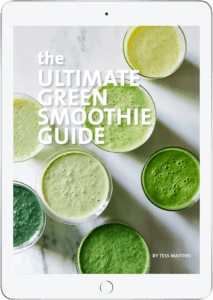 Want to make amazing green smoothies? Give me the free tips! 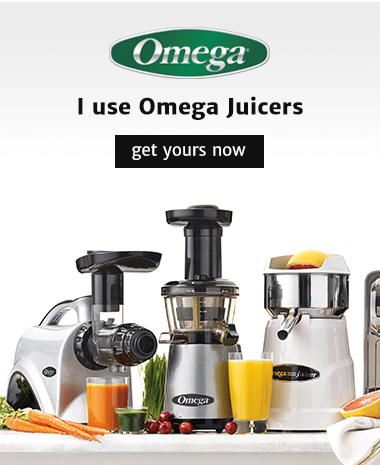 Yes, I want to receive emails from The Blender Girl. 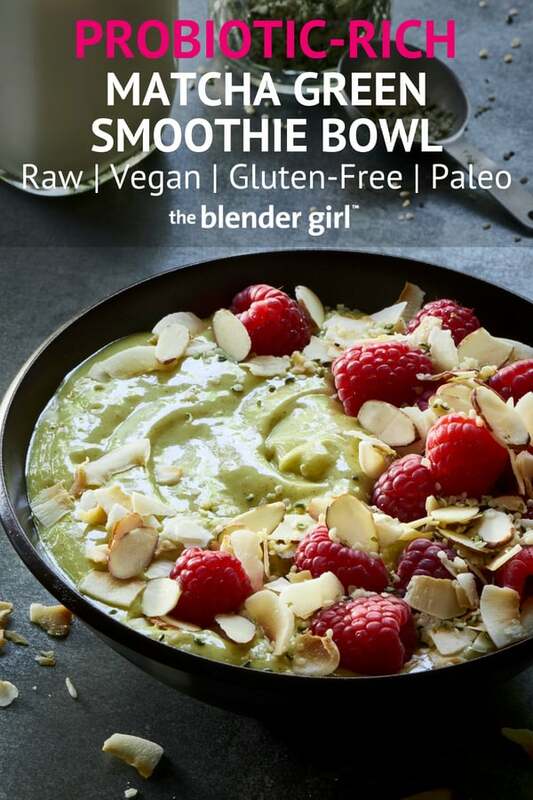 Throw all of the smoothie base ingredients into you blender, and blast on high for 30 to 60 seconds until smooth and creamy. Transfer the mixture to a bowl, and top with berries, coconut flakes, sliced almonds, and hemp seeds. Enjoy immediately. *Probiotic Powder - I add 1/2 teaspoon of probiotic powder to all smoothies to replenish stores of healthy bacteria for immunity, digestion, detox, and to balance the acidic effects of high-sugar fruits and other sweeteners. The really potent probiotics require refrigeration. If you have capsules, break the shell and release the powder. Unsweetened probiotic-rich liquids like kefirs (water, coconut water, milk varieties) or kombucha make wonderful health-promoting additions to shakes, too. *Celtic Sea Salt - I add a pinch (or more) of this alkalizing, mineral-rich salt to all smoothies to boost the natural flavor of fruits and veggies; temper the acidity of sweet fruits and sweeteners; stimulate the lymphatic system; replenish electrolytes; aid digestion; and help the body access energy. I do not recommend adding common table salt which is generally heated to extreme temperatures, iodized, bleached, processed, and refined. This salt does not have the same benefits. If you have a health condition that requires you to limit your sodium intake consult your doctor before adding salt to your smoothies. © 2010—2018 Tess Masters, Inc. All Rights Reserved.